are units that contain FM, AM radio circuitry for radio broadcast reception for hook-up to an amplifier in a stereo system. 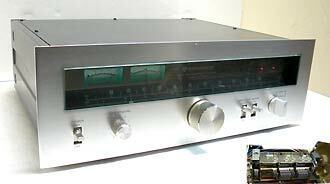 Often only more expensive and luxurious Hi-Fi stereo systems had the tuner as a separate component. I think the most important for selecting a tuner (or also the tuner section in a "receiver") is: how important is radio listening to AM and FM in your listening experience. If only listening to a couple of lcoal stations, that would come in loud and clear with any radio, then probably a simple inexpensive unit will do. The difference between a high end tuner and a inexpensive one for tuning a station that can be easliy received, probably is somehwat dampnened, as boradcast technoligy in it's nature imposes limits to audio frequencies. and some radio stations at times play material that was digitally compressed and does not contain full band width to begin with. There still are audible differences however between different qualities of tuners, so the question: How important is radio listing? The main difference between a simple and an elaborate tuner is the ability to discern stations from each other and to bring in weak stations clearer (sensitivity). An inexpesive tuner would not be able to tune a difficult to tune station as well, as a more elaborate expensive one. The difference I have seen between an inexpensive unit and a top of the line tuner are the amount of circuits used to tune and descerne frequencies form each other. An inexpensive unit usually uses 2 circuits while the better units use 3 and the best 4 circuits in the tuner front end. There are other differences that result in more clearity and detail in sound. Tube tuners gernally are considered to be more sensitive than solid state and sound better, but my experience over the decades has been, that top of the line solid state tuners tune a station more precise, compared to a tube tuner, as technology more advanced. As tube tuners have become extremely expensive a quality solid state tuner would offer a great alternative to hook up to a tube amplifer, if working with budget constaints. If AM listening is you main goal: I tend to believe that earkier units closer to the "golden Age of Radio" tend to focus more on quality AM reception than those manufactured later. The here expressed are optinions only and my own. KT-7300 Analog Tuner: the ultimate in analog tuning - a top of the line piece of quality precision equipment. A very nice tuner that makes the ultimate of FM reception. Perfect also to be used with tube amplifiers. Technology had ripended and this model is provided with the finest technology available at the time: It featurs a 4 circuit 4 tuning section front end. The unti provides multipath jacks on back that allow to connect and oscilloscope for ultimate tuning of FM broadcast radio stations. A quality piece of equipment that these days is quite hard to come by. Condition: The unit is in reliably working and excellent working condition in regards to FM. On the AM side: the original loop antenna that would be mounted the back is missing and without it there is no AM reception. Please consider this as it is an FM only tuner. Rework to present this unit in fully and reliably working condition included to treat all contact items such as the tuning capacitotor, controls and switches with quality contact cleaner. In addition to that: resoldering of aged solder points and check / tweak of the alignments). Lot: The Kenwood KT-7300 stereo tuner as described and shown above. 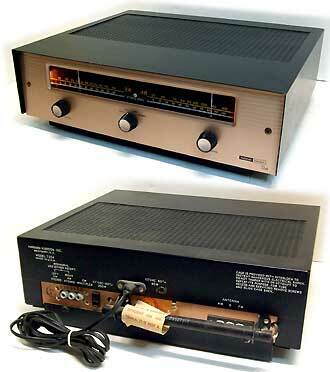 Lot: The Harman/ Kardon tube "Duo" tuner model T224 as described and shown above. T-25 Quartz Synthsized Digital Tuner: A nice simple basic tuner that makes radio listening for FM and AM convenient. This unit provides 6 station memoery locations for FM and 6 for AM (12 total). Will go well with any stereo or audio equipment and with the appropriate audio cable adapter can brinf radio to your computer sound system. Condition: The unit is in fully and excellent working condition. (Rework included resoldering). Lot: 1 Onkyo T-25 stereo tuner as described and shown above. FM-857 Quartz Synthsized Digital Tuner: A more luxurious digital AM / FM stereo tuner with LCD display that makes radio listening for FM and AM fun. This unit provides 18 station memory locations for FM and 6 for AM (24 total) and offers automatic and manual tuning modes. Matches the above listed Fisher Amplifier but unfortunately ccannot be used with any other stereo equipment unless custom modifed (will add $35. Condition: The unit is in fully and excellent working condition. Lot: 1 Fisher FM-857 stereo tuner as described and shown above. Price: $45.00 can be used with any Fisher CA-857 amplifer, or requires custom modification if wishing to use with other standard stereo equipment (can provide for +$35 - which will add a custom power suppy and audio connectors for conection to any amplifier - currently provides only Fisher propriatory connector.